The Fraser Shores Maryborough Speedway will be the place to be on Saturday night, when 48 Production Sedans do battle in the Queensland Title. Defending and two times Champion, Chris Pagel heads the line-up, which also includes National Champion, Joel Berkley. Pagel has won two Feature events for the season and Berkley ten, however, neither of them have won at Maryborough this season. 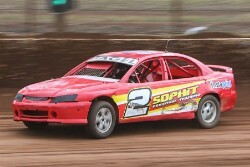 The field includes several drivers from New South Wales, in what promises to be a great night of racing. Steve Jordan who finished on the podium last season is also in the field, along with Josh Crang, Daniel Henshaw, Josh Arthur, Richard Cook, Sarah Franz, Josh Harm and Jim Cowley to name but a few of the drivers who should be prominent across the night.